Matthew Stone’s brushstrokes have influenced the motifs of the Prabal Gurung Resort 2015 Collection, titled « Unconditional Love », after the London-based artist’s eponymous exhibition at The Hole gallery, in New York, from March 6 until April 6, 2014. 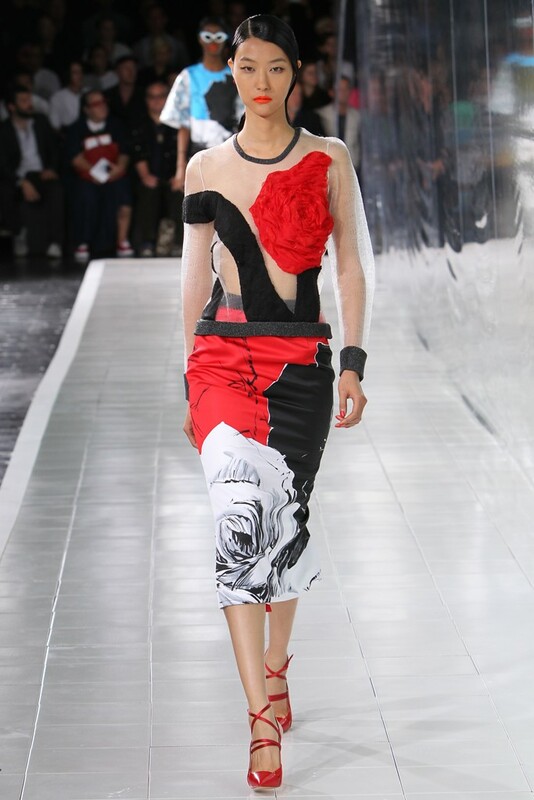 Cecily Brown’s abstract paintings have influenced the Prabal Gurung Autumn/Winter 2014-2015 Show. Another Cecily Brown-inspired collection : Dries Van Noten Autumn/Winter 2011-2012 (some prints were based on Cecily Brown’s works). Roses which featured on photographs taken from Bert Stern’s « Last Sitting » series with Marilyn Monroe (commissioned by « Vogue » in 1962), inspired the floral motifs of the Prabal Gurung Spring/Summer 2014 Show. Other Bert Stern-inspired collection and campaign : Versace Spring/Summer 2014 Menswear (one pattern revisited, in an Andy Warhol-style, a Marilyn Monroe’s portrait by Bert Stern, taken from the « Last Sitting » visuals), Yves Saint Laurent (the ad campaign of the « Rouge Volupté » lipstick, launched in 2008, starring Kate Moss, was based on Bert Stern’s « Last Sitting » images, that Marilyn Monroe had crossed out). Stills from Baz Luhrmann’s « Romeo + Juliet » were pinned on the moodboard of the Prabal Gurung Pre-Fall 2013 Collection. Other collections that were influenced by « Romeo + Juliet » : Dior by John Galliano Couture Autumn/Winter 2006-2007 (the soundtrack of « Romeo + Juliet » was used for the finale of this show), Erin Fetherston Autumn/Winter 2008-2009 (this collection was not specifically inspired by Baz Luhrmann’s « Romeo + Juliet » but it was based on the various representations of Juliet in pop culture), Jen Kao Spring/Summer 2012 (a kimono evoked the sunset scene in Baz Luhrmann’s « Romeo + Juliet », which is one of Jen Kao’s favorite movies).